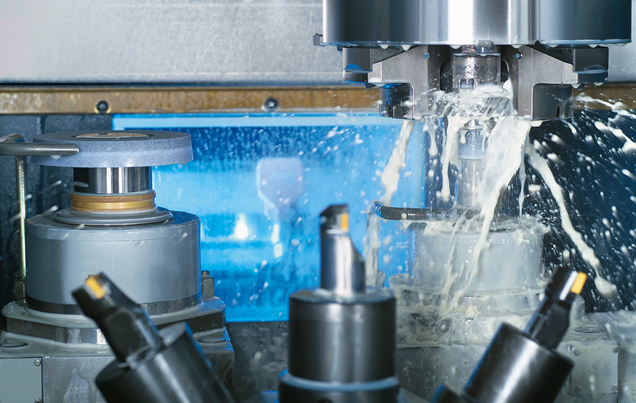 The combination of a number of processes – such as hard turning and grinding – on a single machine, allows for the exploitation of considerable rationalisation potentials. The advantages of the process combination hard turning and grinding lie in the complete- machining of workpieces, greater flexibility and improved component quality. The process combination hard turning / grinding is used, to great effect, to reduce cycle times. Where the complete hard finishing process (hard turning and grinding) is carried out on a single machine, throughput, transport and storage times can be drastically reduced. There are also advantages in the reduction of setup efforts and setting times. In the machining of chucked components (VSC DS Hard Turning and Grinding Machine) the combination of hard turning and grinding is state-of-the-art. There is, however, a considerable rationalisation potential still to be tapped, as by no means all the processes where it would be advantageous to switch to the combination process hard turning and grinding, have been changed. The future will see the increased integration into combination machines of processes such as hard milling, hard reaming and honing, in addition to hard turning and grinding. For shaft machining too, the market offers suitable machine concepts that integrate the hard turning and grinding process (VTC 315 DS Hard Turning and Grinding Machine for shaft components). The use of these systems is, however, not as common as in the machining of chucked components with hard turning and grinding technology, as there are already highly efficient systems based on conventional grinding technology, CBN technology and modern turning technology in existence. But there are signs that the advantages the combination machining hard turning and grinding brings, will also be used more frequently in the machining of shafts. In summary, it must be noted that the combination machining process hard turning and grinding is no longer an exotic thing, but that both the technology and the machines have been well tested. The consistent use of the combination machining process hard turning and grinding and the integration of other production processes will be advantageous in tapping into further considerable rationalisation potentials. 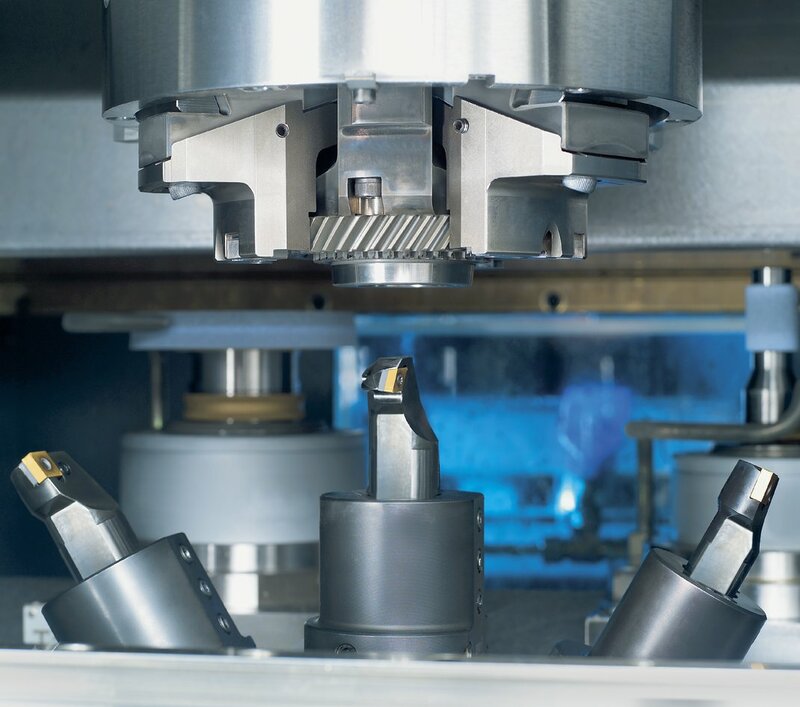 The conventional external cylindrical plunge grinding process is still state-of-the-art in many production environments. The fundamental advantage of process experience is, at the same time, a considerable drawback when it comes to innovation. After all, conventional grinding has been optimised to a very large extent over the years. Grinding has a viable competitor in hard turning, which is a highly flexible process, whose users find it a definite advantage that it can also be used dry. Its one considerable shortcoming remains, as ever, its process stability, with unforeseen fracturing of the cutting edge causing frequent interruptions. Another disadvantage is that the component quality achievable with hard turning on a basic machine is limited to IT6. An important characteristic of CBN plunge cut grinding is a drastic reduction in cycle times, compared to conventional grinding methods. Apart from that, there is also a noticeable reduction in idle times, owing to the high life-cycle of the CBN tool. A disadvantage of CBN plunge cut grinding is the high tooling cost, which makes it almost exclusively a method used in large batch and mass production. 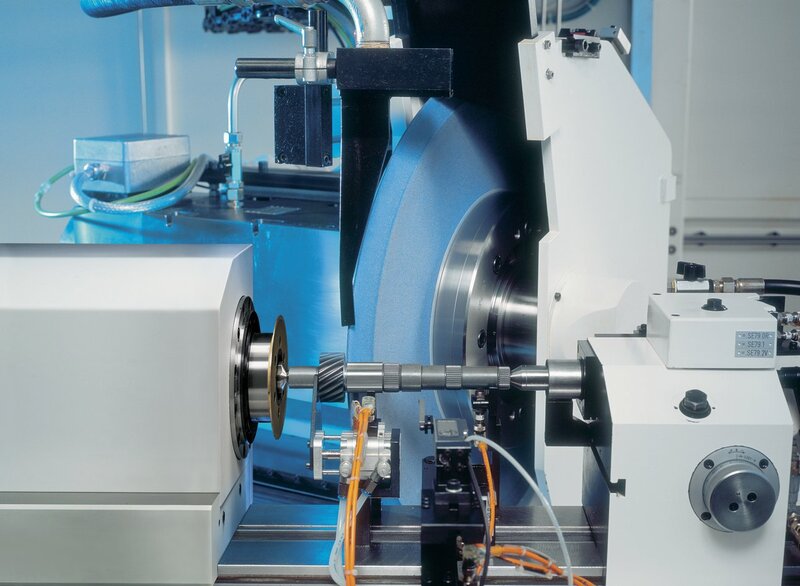 The high-efficiency external cylindrical form grinding or scroll-free grinding is a variant of CBN grinding that uses small grinding wheels to generate a workpiece profile by following the contour under NC control. This is a highly flexible method and thus ideal for the external cylindrical machining of whole component families. The only disadvantage is that the use of high-speed technology and grinding oil calls for a higher capital investment than other alternatives. A typical example of combination machining (hard turning and grinding) is the machining of gearwheels. The shoulders are finish hard turned. Because of the high demands made on their quality, the bore and cone are pre-turned and finish-ground. To achieve this, the machine has been equipped with two grinding spindles, one of which is designed to machine the bore, with the second one machining the external sections of the component. As only a few hundredth of a millimetre have to be ground away, the grinding tools are designed for finishing only. Meanwhile, this process has - to a large extent - replaced single-process grinding machines and can, by rights, be considered state of the art. Another example of the practical application of this combination technology (hard turning and grinding) is the machining of scroll-free seats. A pressure ring needs to have its outside diameter and its face machined, whereby the O/Ds surface must be scroll-free. In this case it would be appropriate to hard finish-turn the face and to pre-turn and then finish-grind the O/D. The grinding wheel is dressed by plunging it into an axis-parallel positioned profiling roll. The grinding process too is of the plunge-cut type. This process makes absolutely sure that scroll marks are avoided. Yet another interesting example of combination machining is the machining of nuts with internal ball tracks, as used in ball screws. These nuts need to have the internal thread, the face, the O/D and the shoulder machined. The concept used allows for the face, the O/D and the shoulder to be hard turned and the internal thread on the ball track to be ground. A machine like the VSC, equipped with Y- and B-axis, is ideal for the purpose. The high-precision B-axis allows the setting of the lead angle of the thread, whilst the Y-axis serves as infeed axis for the machining of the ball track. The machine is equipped with two grinding spindles, which - for pre-turning and finishing work - can be equipped with a variety of tools. The grinding tool profiles are dressed with a separate dressing attachment equipped with diamond profile dressing rolls. The machine is suitable for the use of both conventional and CBN grinding wheels. A 2.5-D measuring probe serves to ascertain the exact angular position of the workpiece. It can also be used for the post-process control of the hard turned surfaces. The advantage of this concept over conventional, sequential processes is that all quality-defining surfaces can be machined in a single setup. Re-clamping errors that affect in particular the alignment of face and O/D to the centre line of the ball groove are thus avoided.